Beautiful? Me? Is That From One Eye or Two? 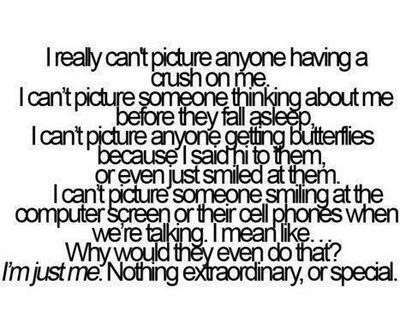 I really can't picture that someone has a crush on me. Or that someone may think about me before they fall asleep. When I think I'm decent, I always have to come across a pretty girl and I conclude that I'll never measure up to that kind of "pretty". And why do I think that, you ask? Well, once I confessed to a guy that I like him which was really awkward because he said that I'm not pretty. And also because once a guy in my class said he has a crush on me. And I'm just like... I'm from his league? Really? Am I that ugly or not pretty? My friends tell me I'm pretty. But I just think "Why would they say that?" A guy never messages me or texts me on any social network. And what also makes me think I'm ugly is that I have a pear shape. My bottom in much much wider than my upper body. And whenever I go outside, like school or anything, and I come close to a guy, I keep whispering in my heart "Please don't notice me... Please don't notice me... Please don't look at me..."
And another thing, my friends are all skinny! I'm the only one with a pear-shaped body. Which also makes me think "Why wasn't I born like them?" I hate pictures (photos). I'm never in a picture. I hate looking at myself in a picture because I don't want to scare people away. When someone compliments me, I automatically think "I mean, why are you telling me I'm pretty?! Tell the truth, don't lie! I hate liars! Tell me I'm ugly!" I never put my pictures on any social network. I don't want to scare people off my profile. I hate compliments. Don't compliment me because they will be lies. If a guy ever fell for me, I just think "Why?" The first thing that comes to mind is this question, "Why not?" The next thing that comes to mind is that you (and I and everybody, for that matter) are unique so, please, don't compare yourself to others - it's just a daft thing to do, really! "We ask ourselves, Who am I to be brilliant, gorgeous, talented, and fabulous? Actually, who are you not to be? You are a child of God. Your playing small does not serve the world. "There is nothing enlightened about shrinking so that other people will not feel insecure around you. We are all meant to shine, as children do. We were born to make manifest the glory of God that is within us. "It is not just in some of us; it is in everyone and as we let our own light shine, we unconsciously give others permission to do the same. As we are liberated from our own fear, our presence automatically liberates others."